AN ORDINANCE OF THE TOWN OF San Luis, Costilla County, COLORADO, GRANTING BY FRANCHISE TO PUBLIC SERVICE COMPANY OF COLORADO, ITS AFFILIATES, SUCCESSORS AND ASSIGNS, THE RIGHT TO USE THE STREETS WITHIN THE TOWN TO FURNISH, SELL, TRANSMIT AND DISTRIBUTE electricity TO THE TOWN AND TO ALL RESIDENTS OF THE TOWN, GRANTING THE RIGHT TO ACQUIRE, CONSTRUCT, INSTALL, LOCATE, MAINTAIN, OPERATE AND EXTEND INTO, WITHIN AND THROUGH THE TOWN ALL FACILITIES REASONABLY NECESSARY TO FURNISH, SELL, TRANSMIT AND DISTRIBUTE electricity WITHIN AND THROUGH THE TOWN. The franchise to be applied for will be for a term of (20) years. The Company shall collect a fee from a surcharge upon Town residents who are customers of the Company. Application to operate at 218 Main Street; filed on: December 31, 2018. All persons interested in the aforementioned application may appear before the San Luis Board of Trustees either in person or represented by counsel, and present testimony, or may submit written correspondence to the San Luis Town Clerk, P.O. 200, San Luis, CO 81152. 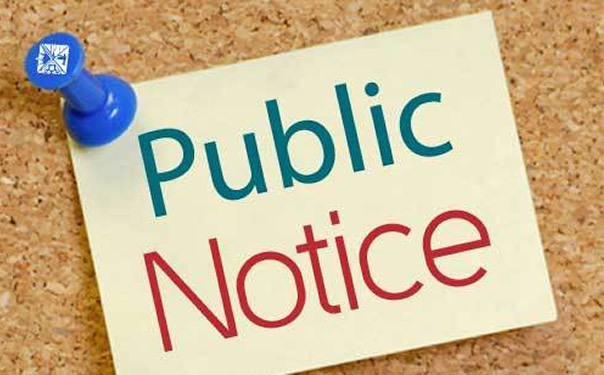 NOTICE is hereby given that a proposed budget has been submitted to the SAN LUIS TOWN BOARD for the ensuing year of 2019. A copy of proposed budget has been filed in the office of SAN LUIS TOWN CLERK, where same is open for public inspection. Such proposed budget will be considered at the REGULAR MEETING? PUBLIC HEARING of the SAN LUIS TOWN TRUSTEES, to be held at the TOWN HALL, 408 MAIN STREET, SAN LUIS, COLORADO on December 11, 2018, at 6:00 P.M.
Any interested elector of SAN LUIS may inspect the proposed budget and file or register any objection(s), thereto, at any time prior to final adoption of the budget. The Town of San Luis would like to remind residents that most building projects on your property, or if adding an accessory building or garage, require a Building Permit before construction begins. If you are unsure whether your project qualifies for a Building Permit please visit the Town Hall before you move forward with any project on your property. All projects require a Land Use Application whether a fee is involved or not. By obtaining a Building Permit before you begin construction on any project you can avoid costly fines, and/or a Notice of Violations being served, associated with not securing a Building Permit. For more information please contact the Town Hall at 672-3321. Land Use Applications are also available for download this website as well as the ability to review the Municipal Land Use Code required by the Town of San Luis.